SEW Porcelain Gallery Victorian Living Dolls, designed by LindaLou Yard Heimann, Harold Mangelsen & Sons, Inc., 1995. Instructions to SEW in three sizes for use with porcelain heads and hands include: A Formal Affair Doll, A Walk in the Garden, A Tea Party. Price crossed off on cover; otherwise, excellent condition. Plastic Canvas Mop Dolls, designed by Carole Rodgers, The Needlecraft Shop, 1990. Designs created using 7- mesh plastic canvas and yarn for "mop strings" include: Caroline, Victoria, Bride & Groom, Chuckles Clown, Jane Ann shelf sitter, and Lacy bear. Center staples slightly rusted, tags on front cover and wear on back cover. Otherwise, very good condition. Plastic Canvas Best Friends, designed by Sandra Miller- Maxfield, The Needlecraft Shop, 1990. 17" tall boy and girl dolls worked on 7-mesh plastic canvas. Like new. Darling Daughters: April Fresh Air Freshener Cover, by Beverly Study, Annie's Pattern Club, 1983. Digest-size leaflet for 14-1/2" tall crocheted doll to cover aerosol air freshener can. Excellent condition. Darling Daughters: BJ for PJ's, by Beverly Study, Annie's Pattern Club, 1983. Digest-size leaflet for 20" tall crocheted doll pajama bag. Excellent condition. Darling Daughters: Miss Becky Hair Spray Cover, by Beverly Study, Annie's Pattern Club, 1983. Digest-size leaflet for 16" tall crocheted doll. Excellent condition. Darling Daughters: Cathy Curler Caddy, by Beverly Study, Annie's Pattern Club, 1983. Digest-size leaflet for 16" tall crocheted doll. Excellent condition. Annie's International Plastic Canvas Club: Beach Bear Set, designed by Brenda Gill, Annie's Attic, 1993. Surfboard and Sunglasses worked on 7-mesh plastic canvas. Patterns to SEW Surfer Shorts, Bikini Top, Hula Skirt, and Lei also included. Excellent condition, but may smell very slightly of cigarette smoke. Annie's International Plastic Canvas Club: Baby Doll Brush Set, designed by Deborah Sauser, Annie's Attic, 1995. Brush and Comb worked on 7-mesh plastic canvas. Excellent condition, but may smell slightly of cigarette smoke. Annie's International Plastic Canvas Club: Clara Doll, designed by Linda Harvey, Annie's Attic, 1991. 15-1/2" doll and dress worked on 7-mesh plastic canvas. Excellent condition. Annie's International Plastic Canvas Club: North American Dolls, designed by Carol Rodgers, Annie's Attic, 1993. 9-1/2" Native American with baby and 9-3/4" Eskimo worked on 7-mesh plastic canvas. Like new. Annie's International Plastic Canvas Club: Mermaid, designed by Sandra Maxfield, Annie's Attic, 1993. 12-1/2" tall Mermaid worked on 7-mesh plastic canvas. Excellent condition. May have faint smell of cigarette smoke. Annie's International Plastic Canvas Club: Troll Twins, designed by Eunice Asberry, Annie's Attic, 1995. 8-3/4" (without hair) jointed dolls worked on 7-mesh plastic canvas. Like new. May have faint smell of cigarette smoke. Annie's International Plastic Canvas Club: Troll Dolls, designed by Eleanor Albano, Annie's Attic, 1994. 6-3/4" tall worked on 10- mesh and 5" tall worked on 14 mesh. Very good condition. May have faint smell of cigarette smoke. Annie's International Plastic Canvas Club: Peasant Girl, designed by Michele Wilcox, Annie's Attic, 1991. Make the doll in 3 different sizes, using 7-, 10-, or 14- mesh plastic canvas. Very good condition. Annie's International Plastic Canvas Club: Madelaine Mop Doll, designed by Darla Fanton, Annie's Attic, 1992. 25" tall mop body doll with head and bonnet worked on 7-mesh plastic canvas. Very good condition. Annie's International Plastic Canvas Club: Mop Doll, designed by Mary Layfield, Annie's Attic, 1991. 24" tall mop body doll with head and hat worked on 10- and 7-mesh plastic canvas. Very good condition. Doll's Roller Skates, designed by Mary Layfield, Annie's International Plastic Canvas Club, 1997. Skates are about 2-1/4" wide by 3" high by 3-1/2" long and are stitched on 7- mesh PLASTIC CANVAS. Very good condition; may smell of cigarette smoke. Simplicity Crochet Fashions 6008, Simplicity, 1973. Tissue pattern sheets for crocheting 20" tall Boy, Girl, and Bear; and 10" tall Lamb and Tiger. Good condition. Fairy Godmother, designed by Leta Anne Nolan, Fibre-Craft, 1988. Dress, Pantiess, Wings, and hat to crochet for 9-1/2" doll in worsted weight yarn. Very good condition. Tooth Fairy, designed by Leta Anne Nolan, Fibre-Craft, 1988. Dress, Panites, Wings, Tooth/ Money Bag, and Crown to crochet for 9-1/2" doll in worsted weight yarn. Very good condition. 87B62 The Robot, by Karla Strom, Annie's Attic, LLC; 1985. Digest-size leaflet for 20-1/2" tall crocheted robot toy! Country Bumpkin, by Marian Tomsu, Annie's Attic, LLC; 1982. Digest-size leaflet for 24-1/2" tall crochet soft sculpture boy wearing bib overalls and straw hat. Former owner folded in half to store in recipe box, but otherwise excellent condition. Shy Annie, by Janet Kottke, Annie's Attic, LLC; 1982. Digest-size leaflet for SEWN "Knee High to a Grasshopper" country girl doll. Complete sewing pattern is included. Annie's Attic Little Knitted Annie, by Carol Staples, Annie's Attic, 1982. Digest-size leaflet for adorable 18" tall knitted ragdoll. Like-new condition. Miniature Living Room & Bedroom, by Patricia J. Stonestreet, Annie's Attic, LLC; 1983. Digest-size leaflet for crochet dollhouse-size Sofa, Chair, Table,Vase, Rug, Fireplace, Bed w/ dust ruffle & coverlet, Chest of Drawers, and pillow. Some page yellowing, but otherwise excellent condition. Miniature Kitchen & Dining Room, by Patricia J. Stonestreet, Annie's Attic, LLC; 1983. 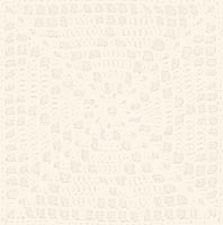 Digest-size leaflet for crochet dollhouse-size furniture, appliances, and rug. Refrigerator is 4-1/4" tall. Might be some page yellowing, but otherwise excellent condition. Miniature Wicker Crochet, by Vicki Bruns, Annie's Attic, LLC; 1982. 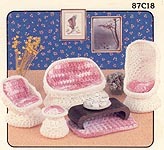 Digest-size leaflet for crochet dollhouse-size chairs, Settee, Footstool, and Rug. Settee is 4" tall. Very good condition. Miniature Crocheting and Knitting for Dollhouses, designed by Rosemary Drysdale, Dover Needlework Series, 1981. CROCHET several tablecloths, Kitchen Mat, rugs, Kitchen Set, Bathroom Set, pillows, afghans, Bedroom Set, and three bedspreads; KNIT rugs, Runner, pillows, floor pillow, curtains, drapes, bedspread, afghans, bedroom set, and Canopy Bed Set. Like new. Page, background, and graphics Copyright © 2005-2012,Hook and Web Designs. All Rights Reserved.